Mamshit is a brilliantly built city of the Nabateans in the Negev. It is situated next to the road from the Dead Sea to Dimona, on an arid, low-sloping hill, not far from Avdat, which is another famous Nabatean archeological site. At one point, before he became Prime Minister of Israel, David Ben-Gurion, who dreamt of settling the desert, wanted to make Mamshit the capital of the future state. The Nabateans were a small but talented people of trading nomads who hailed from the Arabian Peninsula. In Biblical times they were ruled by the so-called Shepherd King of Khedar, who is mentioned in Genesis 25:13-16. Whoever drives through this area will notice brown signs that direct you to the “Spice Route.” This is the ancient road from the Nabatean capital of Petra in Jordan, through the Arava desert in Israel’s most southern part, and onwards to Be'er Sheva, Hebron and Jerusalem. 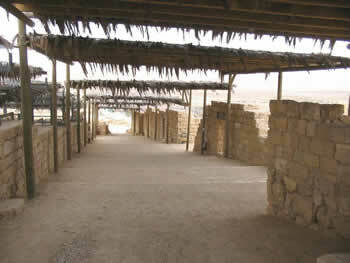 It also connects to Gaza in the west, which the Nabateans used as a port. The road through the difficult rocky terrain from the Arava to Mamshit was cut out by the Romans, and the Nabateans used it to ferry perfumes, like myrrh, balsam and frankincense from Arabia to their customers, besides other imported and native goods like spices and cotton from India, gold and silver, precious stones, ivory, expensive purple clothes (which no Nabatean but their king wore), and sculptures and paintings. A part of a stepped road is located near Mamshit. The Nabateans were experts on how to survive in the desert, which explains why they were able to build a monopoly on trade. They first entered the area of Israel in the 4th century BC, but they were already mentioned in an Assyrian list of enemies that dates from 647 BC. Eventually the Nabateans stopped being nomads. They became very rich from their trading activities and settled down in the southern parts of Israel, where they built cities at distances of 25-30 km, to take a rest and water the pack camels. Mamshit did not only get rich from the trade; it was also known for its horse breeding. There are two houses in the city with stables. The horse that was bred was the small Arabian horse, and it was sold to customers all over the region at a top price. Mamshit was founded in the first century BCE, built in a few generations, and the buildings were of such superlative quality that they were still being used four centuries later. The Nabateans were also masters at water management. Household supply was taken care of by collecting rain water in cisterns. There was also a small perennial stream outside the city, which was carefully preserved by a dam. In 63 BCE the Nabatean country was conquered by the Romans, but their king Aretas III (40 BCE - 9 CE) swore allegiance to the Emperor, and he was able to keep his lands. 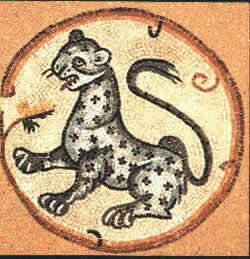 Notwithstanding the Roman control, Mamshit reached the peak of its prosperity during this period. However, in 106 CE Rome annexed the Nabatean kingdom, which had already lost some of its lands to the Jewish King Herod, and it became a province, called Arabia. 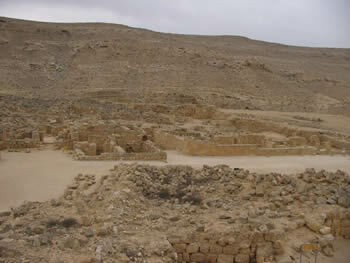 A Roman garrison was placed in Mamshit, to protect the trade route. There is a Roman cemetery with headstones that are inscribed in Latin. The Romans also started building a wall around the city, to protect its wealth, which was sometimes attacked by wandering nomads. Not much is known about the contact between the Nabateans and the Jews, besides the fact that they traded together. The only time that Jews ventured into the desert was to hide or to flee from the repressive Roman regime. The 1st-century Roman historian Strabo writes about a Jewish sect, probably the Essenes, who sought and found harbor in the Nabatean kingdom. On the other hand, the Nabateans were faithful to Rome and some historians think that they helped them quell the Jewish uprising. After the Romans left, the Byzantines took over in the 4th century. They reinforced the city wall, and erected two churches. No cultic remains of the Nabateans have been found in Mamshit of their own religion, which was polytheistic and based on deification of natural powers, like the sun god, the god of the wine, the moon and the water. Again according to Strabo, the Nabateans worshipped their gods on the roofs of their houses, but the roofs were the first thing to disappear. Around the year 500 Mamshit was abandoned. Its last historical mention is on a 6th century map, in which the city is called Mampsis, and which shows a picture of the gatehouse at the main city entrance. The Nabateans were famous for stone cutting, and one look at the sprawling city on the hill immediately makes this evident. A typical stone was hewn out of the rock, and with a sharp knife slanting stripes were carved in it. It’s amazing how sturdy the buildings look; as if they are much newer than their official date. Another exciting feature is that some of the streets are still intact. The first building that is reached from the parking lot is the caravanserai from the late Nabatean period outside the main gate. This was the place where the Nabatean camel drivers rested, while the traders did their business in the city. The main gate appears in the 900-meters long wall. Behind it are accompanying buildings. In the ground pavements, tracks of wagons can be seen. The gate was burned in the Arabic period. A blue line in the walls indicates the original stonework which is superimposed by reconstructed stones. There is one other gate, much smaller, which overlooks the dam in the wadi. There were originally three dams, each one progressively higher, but only the lowest has survived. Three watchtowers ensured the water source was well guarded. A bit more to the south there is a path to the dams, for those who want to see it up close. The next site is the House of the Affluent, which is a huge villa. Near the entrance is a cistern, which collected rainwater. The central courtyard is surrounded by rooms, and a well-preserved staircase leads to a tower, which is also preserved to an impressive height. There is one room with two different sets of arches, which cannot have been in use at the same time because the one set runs north-south, and the other east-west, so it means that the arches and the stone beams that they supported were changed at some point. 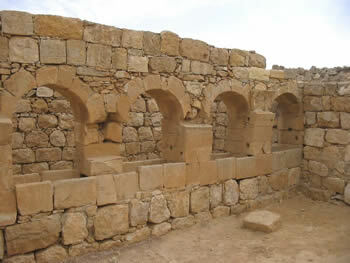 Inside the house, there are typical Nabatean architectural features, like plinths and capitals, and several walls have round and square cubicles which were probably used for storing things. The Tower is next to it. Its roof has been reconstructed as an observation point. Its original height was three stories. The next building on the route is the Western Church, or Nilos Church. Its entrance, sided by a cistern, was directed in the direction of Jerusalem. The hall of the church is decorated with beautiful mosaics, representing a fruit basket, peacock and other birds. There are five Greek inscriptions in the mosaic which mention the builder of the church, Nilos. The church is partly built over another big house of later date. This explains why there is a huge cistern next to the church. It is covered with a Nabatean invention of a roof made of stone beams, which is covered with plaster. This is the first house that contains stables. Each of the 16 horses that fit into the stable had its own space to stand in, and a manger. Another room in the house is a bathroom with a sitting bath. On the other side of the city, there is the Eastern Church, which also has an attractive mosaic floor. Going down the hill, there is a market, with shops on both sides. Just off the market is the most beautiful house of the city, which is called the House of Frescoes. One room has a fresco on a round beam of a head, possibly of a deity. On the right wall, inside a red square lining, there is a lovely painting of the gods Cupid and Psyche from Greek mythology sitting on a low bench and kissing. In another room off the courtyard there is again a room for horses, with individual arches and a manger. The horses that were kept here must have been tiny, by the way. There is also a cistern, which received its water from a collection basin in the courtyard, which in its turn received rain water through a channel in the wall down from the roof. In the house there are scattered capitals, some of which bear sculpted decorations of a bull’s head and the head of a man. Inside the house, a large coin hoard was found in a bronze jug, consisting of 10,500 silver coins from the 3rd century. Down on the slope there is a pool which was originally covered with wooden beams, which is very rare in Mamshit, because there are no trees in the vicinity, and everywhere else stone beams are used for roofing. The water for the pool was brought from the Mamshit stream with donkeys. Next to the pool is a bathhouse. It had three chambers with baths in different temperatures: one cold, one lukewarm, one hot, which was fueled by a furnace underneath the floor. One room was the dressing room. The bathhouse was heated through ceramic pipes. While we’re in the neighborhood, we also visit Maon, nearby Be’er Sheva, which has the only synagogue that has been found in the Negev until now. It is built on the remains of an ancient village and it dates from the 6th century CE. It is not a National Park, which means that visitors should ask in advance about opening hours at the Offices of the Regional Council of the Negev during working hours, or at the office of Kibbutz Nir Oz. The synagogue has a bema which is directed towards Jerusalem. The synagogue is worth a special visit, because of a magnificent floor mosaic. The medallions sprout out of an amphora, like a vine. 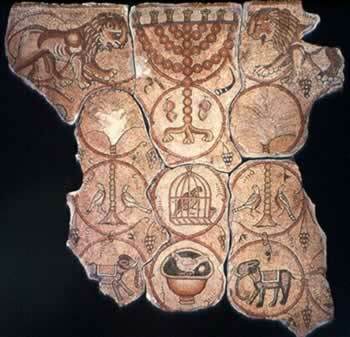 The overall decoration is of a large variation of animals, wild and tame, and there is a menorah in the center. Outside, on the eastern side of the synagogue, there are a ritual bath, a cistern and water channels.